ROCKY ROAD | in style of Emily. 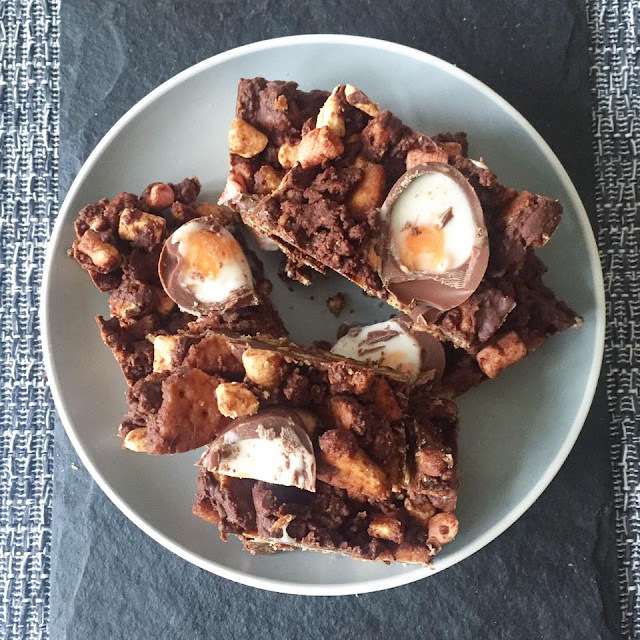 If you happen to have any Easter chocolate left over like I did, or fancy making some quick and easy treats, then Rocky Road is definitely the answer! I had a few small chocolate eggs left over including some cream eggs and fancied compiling them together to make something tasty, instead of them sitting on the side lasting forever. Rocky Road is one of my favourite traybake treats and theres so many different options as to what you can put in them. - any chocolatey/sweet extras you wish you throw in (I chose creme eggs) but I've also made them before with added chocolate chips, raisins or peanuts. 1) Heat together the unsalted butter, dark chocolate and milk chocolate in a saucepan over a low heat until fully melted. 2) Add in the golden syrup, stir well and take off the heat. 3) Crush up the biscuits in a sandwich bag into small bits and add to the chocolate mixture, mixing well with the chocolate. 4) Add the marshmallows to the mixture and stir well making sure everything is coated in the chocolate. 5) Pour the mixture into shallow rectangular baking tray and flatten down. 6) Add the extras onto the top making sure they're pushed down into the mixture to make it level. (I cut my creme eggs in half and placed them on the top). 7) Place the tray in the fridge for 2 hours or the freezer for 1 hour to harden. 8) Make sure you remove the rocky road from the fridge/freezer about 20 minutes before you want to slice them and eat them so that they have time to soften slightly.